Milkweed belongs to the family Asclepiadaceae which was named after Asclepius, the Greek god of healing, because of the many folk-medicinal uses for the milkweed plants. 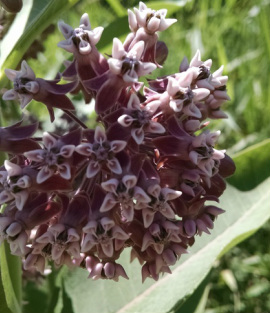 Although many different tribes of Native American Indians used milkweed in a variety of ways from contraceptives to improving lactation or from laxatives to treating warts, the plant is toxic. 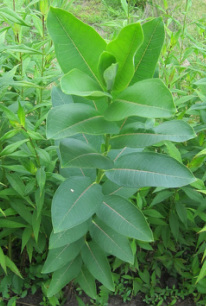 In the past it was used as a diuretic, emetic and purgative, probably because the body was trying to rid itself of the poison from the milkweed. Some herbalist say milkweed can be boiled to remove the toxicity of the sap, but it is a risky business. Milkweed should never be eaten and I would not recommend trying it for any curative treatment. Milkweed grows from Canada to Texas but it tends to be an eastern plant. Marion County, Oregon is the only county west of the Rockies where milkweed plants have been found. Common milkweed (Asclepias syriaca) is a large perennial plant that can is generally two to three feet tall. The leaves are large, long ovals opposite each other. The name “milkweed” comes from its white, milky sap. The sap several contains toxic chemical compounds. One of the chemicals is a type of steroid that affects the contractions of the heart and is what make the milkweed toxic to humans and livestock. Milkweed may even cause death when animals consume 10% of their body weight which is why it is so dangerous for small children. Other chemicals cause some people get a rash just from touching the sap. With all these warnings one might wonder if the plant has any redeeming qualities. The main reason to leave the milkweed plant is to feed the monarch butterfly. Milkweed is the only food source for monarch caterpillars. They are not bothered at all by the chemicals in the milkweed. In fact, the toxins from the milkweed are stored in the caterpillar’s body and remain in the butterfly. Predators learn that eating monarch caterpillars and butterflies make them sick so they leave them alone. 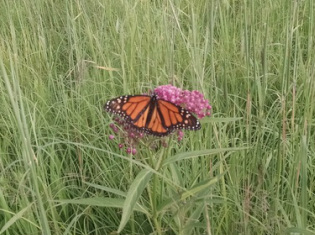 Although the viceroy butterfly does not eat milkweed and is not poisonous, it looks like a monarch -- they are just a little smaller than monarchs and have a black band on their rear wing. The similarity is enough to convince predators to leave them alone. I saw a flower by the pond last week and thought it looked like a Joe Pye Weed. I grabbed my camera to take a picture and was surprised to discover a monarch caterpillar on it. Since monarch caterpillars only eat milkweed and the closest milkweed was about fifteen feet away, I couldn’t imagine why it was there. So I decided I’d do my good deed of the day and move him/her back to the milkweed. Later, on further investigation, I realized that my “Joe Pye Weed” was actually a swamp milkweed (asclepias incarnate). “Swamp milkweed” is a very unattractive name for a such pretty flower. In retrospect, I probably just confused the poor caterpillar who had been content where it was. (Not that it slowed down any, I checked a few hours later and it was happily munching on the common milkweed). Milkweed is a unique plant and people have experimenting with potential uses for year. The dried stalks can be harvested in the fall. Inside are fibers that Native Americans used to twist into string or cords, or even weave into coarse cloth. Milkweed seeds are contained in seed pods. When they are ripe the pods open and the seeds with their white silky filament-like hairs are carried away by the wind. During World War II, children were encouraged to collect the seed pods and over 5,000 tons of milkweed silk was collected to use as down to fill life jackets. The silky fibers have also been used in mattresses, upholstery, stuffed toys and since the soft silk filaments are hollow and coated with wax they've even been used for insulation. Recently, milkweed has begun to be grown commercially as a hypoallergenic filling for pillows and comforters. Also during World War II both Germany and the United States experimented with the milkweed sap which contains about 1 to 2% latex, as a source of rubber. As of yet, this has not proven to be successful enough to be marketable. Although milkweed is not that useful to the average gardener, it is not invasive and not unattractive. The swamp milkweed is actually a very pretty perennial for the back of the garden. And last, but not least, everyone likes to watch the monarch butterflies in the summer as they go from flower to flower pollinating the plants.